Hi Jo – Just to let you know that we were really impressed with the work you did with our two Dobermanns, Alfie and Chloe. In the space of an afternoon you gave us two happy dogs in place of one stressed and anxious rescue dog and one dog whose life had been turned upside down by the new arrival. Just two days after your visit they are playing happily, sleeping in the same room, calm and generally enjoying life together as are my husband and I now! Your skill and attention to detail is second to none and worth every penny and then some. Anyone looking for a solution to their dog problem, big or small, should not hesitate to contact you as they will not regret it. NEW for 2017: Thinking of getting a puppy? Just taken delivery and feeling overwhelmed or would you just like to be the envy of every dog owner at the park? Jo provides everything you need to know in a bespoke and detailed series of 30 HD quality puppy training films, with expert written literature containing invaluable guidance and advice on key puppy behaviour subjects. All new dog owners have the desire and motivation to raise a well behaved puppy and guide them to becoming an adult dog they can be proud of. Despite this, problems often arise and it is not always easy to find the right help. 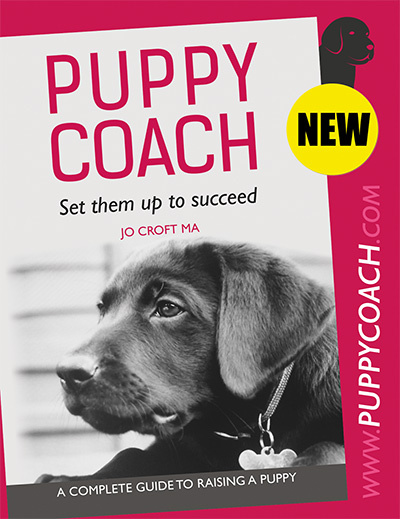 The Puppy Coach guide has been designed with education in mind, covering detail on all the important areas of puppy development. You will get to follow the exciting journey of Hogan, an attentive, high energy working Labrador and how Jo prepares him for adulthood. You can look forward to being a knowledgeable dog owner with a dog to be proud of after reading this detailed and interesting book.